Saimatec RoboWrap is the selection for most efficient paper production lines. This technology provides an optimal balance in wrapping material consumption, handling, management, logistics and performance, with top quality protection of the precious paper roll. RoboWrap Standard is the proven performer for high-output paper mills with maximum capacities ranging typically from 100 to 150 rolls per hour. The system is designed with ease of operation and maintenance in mind, and is operated by one operator supervising the production. Constant operator interaction is not needed, and tasks may be combined with other production functions such as warehouse or rewinder operations. Handling of inner and outer heads are automated with one robot for each. Labeling is also automated with a robot or manipulator, depending on the layout. As other members of the Robowrap family, the Robowrap Standard is available in two variants: Classic and Optima. The Classic system uses a single wrap for each roll size. Cycle time of the Classic style wrapping is essentially the same for all roll widths, and the roll is protected to maximum as the wrapper has no seams. Classic system requires that the whole selection of wrappers for all roll widths is available, making the inventory rather large (up to 10 wrapper widths in use). The patented Optima system uses a limited set of wrapper widths; typically 3 to 5 wraps ranging from 1000 to 2000 mm in width. The majority of rolls are wrapped in single wrap as in Classic system, making the Optima system just as fast for smaller rolls. The larger rolls are wrapped in overlapping wrapping style. 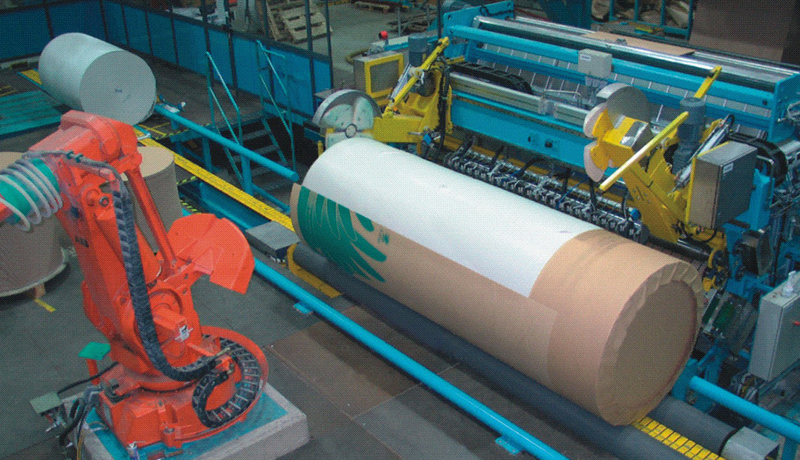 The key element of the Optima Method is the unique laterally movable wrapping station which moves the roll between wrapping phases. Robowrap Standard system is designed in a robust style for all roll sizes, up to 5000mmin width and 10000 kg in weight. The final customers of paper are happy with their valuable paper only when receiving it in perfect condition. Therefore there cannot be any compromise in wrapping quality.